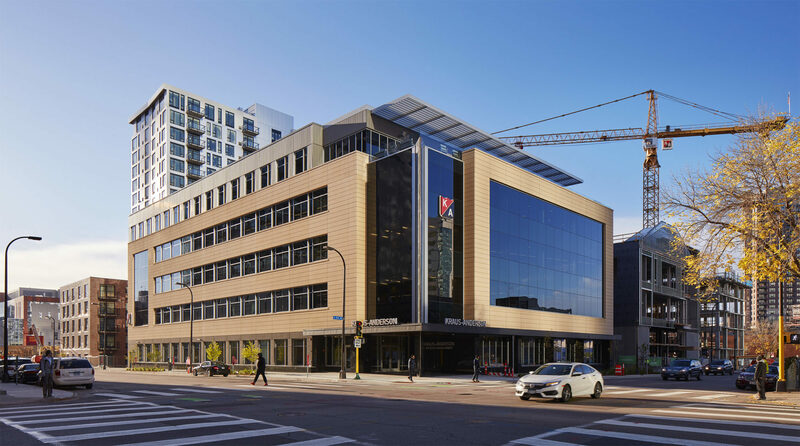 MINNEAPOLIS, Minn. (October 2017) — Kraus-Anderson (KA) is celebrating the completion of its long-anticipated, new downtown Minneapolis headquarters located at 8th St. and 5th Ave. Employees from throughout the metro are now moving into the 100,000-square-foot campus, which consolidates the company’s Twin Cities operations under one roof in a five-story facility. Kraus-Anderson, which has been headquartered in downtown Minneapolis since 1897, was led by Lloyd Engelsma, who grew the company into one of the largest construction firms in the country. The new headquarters will accommodate approximately 300 employees, doubling the current downtown staff with room for future expansion on the site. Consolidation will combine employees from the Kraus-Anderson Construction office in Circle Pines, and Kraus-Anderson Realty Company and Kraus-Anderson Development offices in Bloomington. The new building also will house Kraus-Anderson Mortgage, as well as the parent corporation, Kraus-Anderson Companies. Kraus-Anderson Insurance, one of the region’s largest privately held independent insurance and risk management firms, will continue to operate from its offices in Burnsville. Mike Hille, executive vice president of Kraus-Anderson Realty & Development, also is looking forward to the increased synergy of one central downtown campus. KA also believes its new, modern, energy-efficient office environment with leading-edge technology will bring new talent to the company. The state-of-the-art campus will attract, retain and develop diverse talent, nurture creativity, provide ongoing training and leadership initiatives, and offer health and wellness programs – all in a bustling downtown environment that is appealing to millennials. One of KA’s building configuration objectives was to enlarge and enhance its mission-critical educational training center — Kraus-Anderson University (KAU) – which provides employees with lifelong learning, grounded through the targeted development of technical and leadership skills. The new training space allows KAU to regularly offer courses to hundreds of architects, engineers, business partners and others working in various areas of construction management. The main entrance to the new corporate headquarters is positioned on the northwest corner of the block so it becomes a natural extension of the downtown business core. The first-floor entrance lobby includes a spacious waiting area, conference rooms and employee cafeteria with large windows for maximum daylight. The first floor also includes the employee fitness center with locker room facilities. The majority of employee office space is located on floors two through five. An open office concept is used throughout the building, featuring electrically operated workstations, allowing employees to easily change from sitting to standing positions. Cost-effective sustainability, systems and technology measures also include a high-efficiency temperature and equipment monitoring network, energy-efficient LED lighting, daylight harvesting controls, and large, tint color windows that limit solar heat gain while allowing daylight to penetrate toward the center of the building. Designed by Pope Architects, amenities also include a rooftop deck, formal and informal meeting areas, and an appealing, well-landscaped exterior. The building also includes two levels of underground parking to serve KA’s office employees. KA teamed with Minneapolis-based ESG Architects to develop the downtown block bounded by Eighth and Ninth streets, Portland and Fifth avenues in the East Town district of Minneapolis. Guided by the Downtown Neighborhood District, the block development provides significant enhancements for the City and the neighborhood, and for KA employees and business partners. It also addresses the Portland Corridor initiative that focuses on the neighborhood’s economic, aesthetic, historic and environmental needs, including Elliot Park’s master plan with considerations for housing and pedestrian-friendly streetscapes. The development includes a 17-story, 307-unit multi-family H.Q. apartments, managed by Saturday Properties; The Elliot Park Hotel, an eight-story, 165-unit boutique hotel developed in partnership with KA and part of the Marriott Autograph Collection®; and Finnegans House, an innovative four-story, 43,500-square-foot production brewery, taproom, Brewer’s Den Social Club and innovative “Finnovation Center” for social entrepreneurial ventures. Finnegans and H.Q. apartments are expected to open in the spring of 2018, and The Elliot Park Hotel is expected to open in the summer of 2018. Established in 1897, Kraus-Anderson, an EOE AA M/F/Vet/Disability Employer, is headquartered in Minneapolis, Minn. and has regional offices in Madison, Wis., Bismarck, N.D., and Duluth, Bemidji and Rochester Minn.